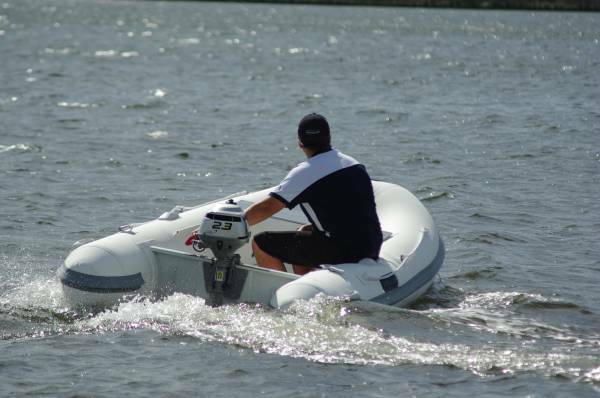 One of the current best selling categories of boat is the small rigid inflatable, and not just for the traditional tender role. People with no space to park a trailer boat can store them flat up against the wall in their garages; they can go flat on the roof rack of a car towing a caravan. It is as tenders, though, that most of them get bought, and usually for their kindness to the mother ship’s topsides rather than their space saving abilities. 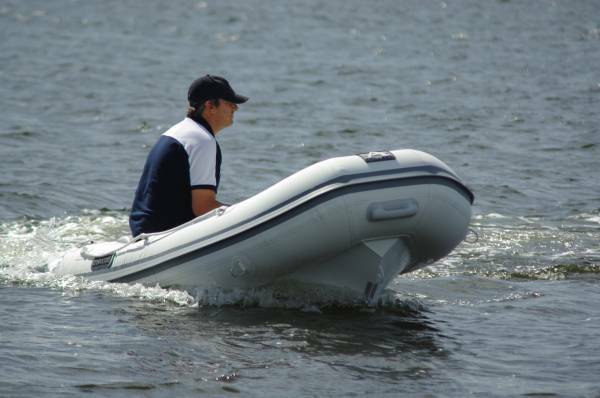 The Aristocraft Searover 2.9 is the typical size for a tender: 2.9m long, about 50kg in weight, and rated to carry four adults. It is a little unusual in having an aluminium hull instead of fibreglass. 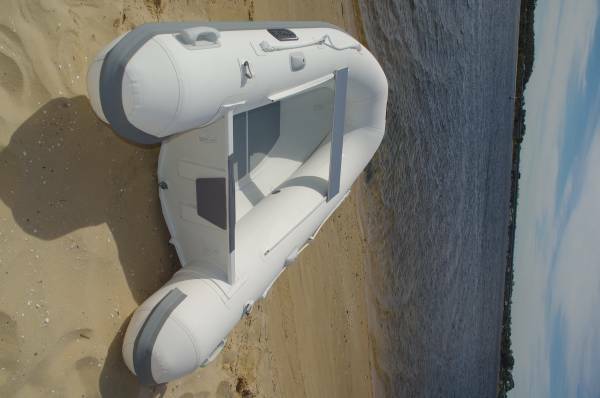 This holds the weight down, and takes more kindly to being dragged over beaches. Of course with a motor that big and used for that extra purpose it would not qualify for the registration-free tender status. Our boat approached horsepower from the other end of the scale with a 2.3hp Honda. 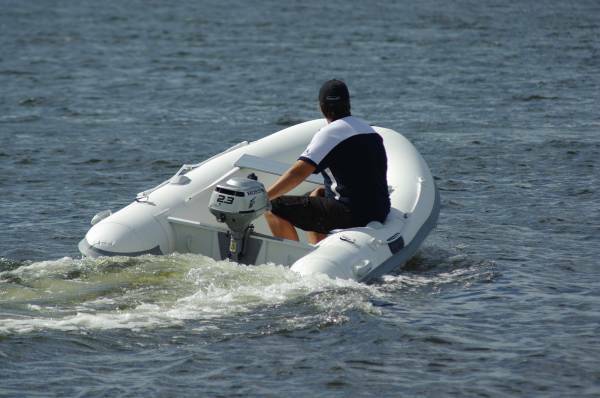 For the boat to beach job in a speed limited area there is little call for more power, and this particular motor has a lot of qualifications for the part. To start with it is air cooled: no need to take it ashore for fresh water flushing – not that carrying it anywhere is a pain with a weight of just 12.2kg. Or a kilo heavier with a full load of fuel; yes, the integral tank holds just 1.1L. And it will run for an astonishing time on that with its microscopic thirst. This is one of the simplest to operate motors ever built. A 57cc power head needs only a light effort on the starter cord, which gets it going in what is effectively neutral. There is actually no gear engagement: instead there is a centrifugal clutch like a chainsaw. Twist the throttle (there is a proper twist grip, unlike the common, less convenient lever) and you are moving. To reverse, simply rotate the motor until the propeller faces forwards. 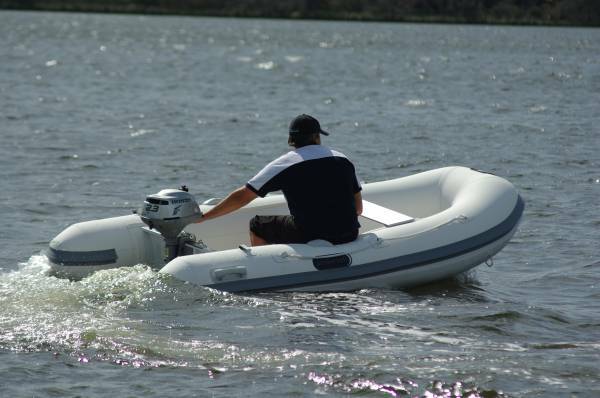 Most people will prefer to sit on the side tubes, which are equipped with fore and aft safety ropes, but there is also a cleverly designed aluminium thwart. This slides to an infinite choice of positions along soft tracks glued to the tubes, or slides off altogether if you prefer. The tubes themselves are made of Japanese Hypalon, the high grade material with great resistance to sunlight. At a few hundred dollars discount you can substitute PVC, but with its short life why would you bother? For added safety the tubes have three separate air chambers. 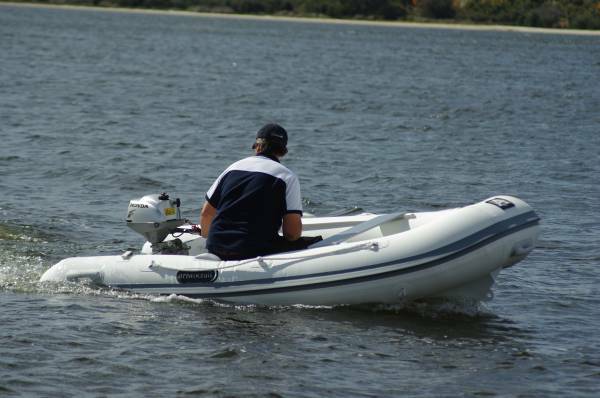 The Searover comes with a boat cover, a pair of two piece oars and rowlocks plus storage strops on the tubes, a repair kit and a foot pump. That last item raises a point: why would you go to the expense of davits for an inflated boat that is light enough for a couple of adults to lift aboard by hand, and that can be deflated to stow somewhere convenient? It makes even less sense if you have a teenager or two who can earn their passages on the foot pump. A de luxe, well thought out tender that is rugged enough to be a constant travelling companion.